Yup. Give something for people to debate about. I know two people on their second Siennas. Hard to argue with repeat buyers while the OP is complaining about their Chrysler product numerous times. Remember, though, my earlier post about my old friend who had issues with both of his Siennas...one was his personal one, the other for company use. I have heard you say that, but at the same time, my brother bought a second Sienna and another friend I know, (although younger than me and in a different place in her life) bought one as well and has no complaints. These two have never complained all the while the OP is complaining all the time about the issues of a Chrysler product, I think I know which one I would recommend. Both, of course, are very popular, although the Sienna does have one significant advantage.....an AWD option. Last edited by mmarshall; 04-09-19 at 12:29 PM. Better reputation, better resale value for the Sienna as well. 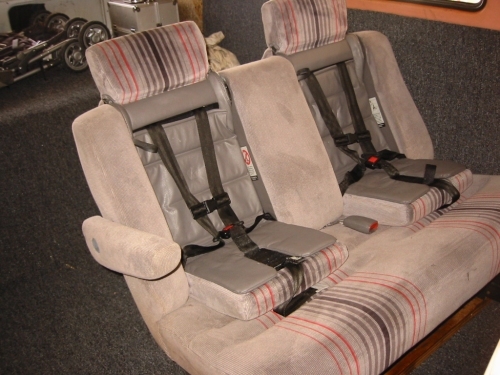 One thing that I wish the Chrysler minivans would bring back (and it was a superb feature for parents with small kids) is the built-in Kiddie Seats that were actually part of the vehicle's seatback itself. No fumbling around with aftermarket seats and straps....just sit Junior down on the pull-down seat, buckle a strap or two, and that's it. When you are at your destination, just unbuckle the strap, lift Junior out, and that's it. I can't imagine there's anyway those would pass modern safety regulations. Although I have no children, everything I've heard from my friends who do leads me to understand that car seats are serious business. The car seats were an awesome idea, but they couldn’t go rear facing, of course, and couldn’t keep up with the changing regulations. Do my eyes deceive me? Am I reading this correctly, that Jill is quoting CR? Only when it benefits her proposition. Hard to argue with repeat buyers while the OP is complaining about their Chrysler product numerous times. It's only hard to argue with repeat buyers when they do so based on research and data. There are plenty of (1) blind loyalists, (2) uneducated shoppers, (3) people who fear change (or some combo), and (4) people that are on the leasing hamster wheel and concede to getting another because their dealer "made them a great deal" to turn in early; ETC; that make them repeat buyers. I have a neighbor that will only buy Hondas, no matter what. Won't even look at another brand. That says something about Hondas, but it also says something about the owner. It was an interesting idea--Volvo had built in booster seats about a dozen years ago--but newer booster seats with the backs for smaller kids have a seatbelt guide slot to keep the belt off their necks. So this set up is outdated, and less safe, even though it's handy. As BrettJacks said, a built in car seat would be an absolute NO NO. Last edited by tex2670; 04-09-19 at 05:05 PM. It says that the owner, for whatever reason, may actually be happy wth his or her purchase or lease. Look, for example, at the extremely high owner-satisfaction-ratings for the Corvette, Dodge Challenger, and Dodge Charger that are published in Consumer Reports......vehicles that we all know are a long way from the top in the reliability-ratings. Yes, they often have to go back to the dealership to have various problems and defects repaired, but they do something that a number of vehicles with Rock-of-Gibraltar reliability cannot do.......they make their owners pleased to own and drive them. Life is short, and, while we may not always agree with how people spend their money (and I spend a significant part of my own life giving auto-advice and helping other people come to a decision on how to spend their vehicle-dollars)...in the end, one must remember that they worked for their money (sometimes very hard) and, assuming they can afford the vehicle, they have the right to spend it on something that will give them some satisfaction for the hours they worked for it. Last edited by mmarshall; 04-09-19 at 06:24 PM. That, in and of itself, means nothing. If a person is "happy" with their vehicle, and just blindly gets another one without cross shopping, that does not prove that their vehicle is better than the competition. You should know better than most that there are many, many consumers out there that are not truly "educated" when it comes to their auto purchase. If a person is "happy" with their vehicle, and just blindly gets another one without cross shopping, that does not prove that their vehicle is better than the competition. With all due respect, I don't think you quite grasp the point here. With buyers like that, the issue is not trying to necessarily one-up the competition or Keep up with the Jones's, but to have something they personally enjoy, and can look forward to driving each morning. I, for example, like driving big Buicks, even if they are not as reliable as a Lexus ES or Toyota Avalon. And, almost half a century ago, when I was in college, I liked driving.....well, big Buicks.